When it comes time to replace your air conditioner, you want to make sure that you are considering brand, type of cooling system, size of the AC unit, the SEER rating and the price. But the most important part in choosing a new air conditioner for your St Louis home is choosing the right air conditioning contractors to install it. At Hoffmann Brothers AC installation contractors, when you receive a bid for a new air conditioning installation from our St Louis, MO air conditioning office, your project manager will perform a full load calculation, including measuring and sizing the ductwork and making sure the air conditioning system they recommend is the right size to maximize comfort in your home. Our team will sit down and go over all of the different options in choosing a new cooling system, and will make sure to apply all current rebates, incentives, financing, and coupons to the price! View our 6 Installation Guarantees and know you are in the right hands with Hoffmann Brothers’ experienced air conditioning installers. Hoffmann Brothers understands all that goes into installing air conditioners, and we will advise on the very best AC replacement to get you through the hot St Louis summers. 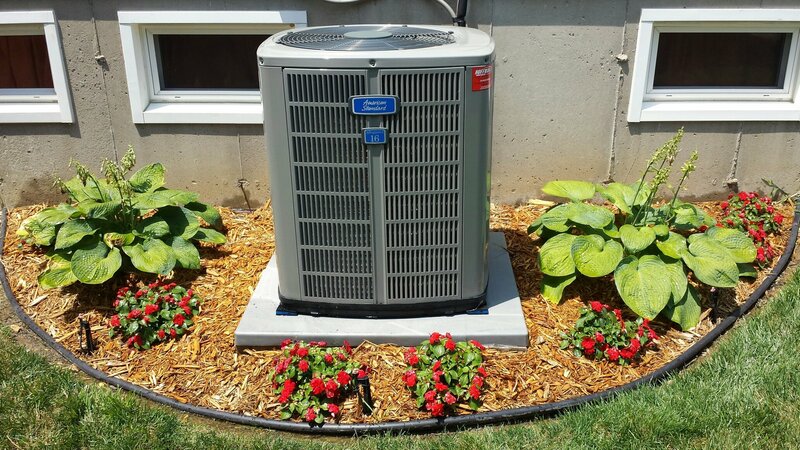 You can rely on Hoffmann Brother to install an air conditioner that is not only energy efficient, but will provide comfort for you and your family all summer long. You can request a free estimate anytime with our Project Managers by filling out our quick online form. Ductless AC systems are becoming much more popular in the St Louis and Metro East area homes. These air conditioners are installed without ductwork. They are great to put in a home when you are adding on a home addition, sun room, or not getting enough air flow to the 2nd or 3rd floor. An AC Installation contractor can perform a Ductless AC installation in your entire home as well. To learn more about ductless air conditioning and a ductless AC install, visit our ductless air conditioner page or call 314-664-3011. Heat Pumps can provide both air conditioning and heating for your home. They are a very efficient way to heat and cool your space. Heat Pumps transfer heat inside and outside your home. Heat Pumps are very quiet in their operation and environmentally friendly. Hoffmann Brothers’ Project Managers can help you choose the best Heat Pump for your home at no charge to you. Our licensed heat pump installation team is standing by to serve you. To request a bid, fill out our form or call us at 314-664-3011. Properly Sizing the Equipment: Undersized equipment, ductwork, and refrigeration piping can affect the functionality of your air conditioner. Make sure the contractor you receive pricing from performs a full load calculation on your home. Hoffmann Brothers’ Project Managers perform a full load calculation at every estimate to take into effect all the windows and doors and the square footage of your home. SEER Rating: Seasonal Energy Efficiency Ratio or SEER Rating is the efficiency rating of the air conditioner. The higher the SEER the more efficient the air conditioner and the lower your monthly bill will be. Hoffmann Brothers offers AC units rating in SEER ratings from a low of 13 to a high of 20 SEER on a standard air conditioning system. SEER ratings of older AC units are typically very low. Air conditioners wear out over time and have older technology. It is typical to find old AC units with SEER ratings of 6-10 SEER. By upgrading and replacing your air conditioner, our customers typically see a large reduction in utility costs as well. Single vs. 2 Stage Air Conditioners: Air Conditioners are available in single stage or two stage units. Two stage air conditioners are more efficient (lower electric bill) and provide better humidity removal. If you plan on being in your house for more than 5-years we recommend a two stage AC unit. Zoning Capabilities: Zoning systems are installed to even out hot and cold spots in a home. A two story home is a perfect application for zoning. A zoning system would allow you to have a thermostat for each story without having multiple systems. If zoning is something you are interested in, make sure to mention to your Project Manager. Making sure you have all the options in your air conditioner is important for long term satisfaction. But the most important day is the day the air conditioner is installed in your home. Having a licensed and qualified AC installation contractor like Hoffmann Brothers perform a central air conditioner installation or other type of AC install is important for how that air conditioner is going to work for the life of the ac unit. Request a bid from Hoffmann Brothers today to get started on new air conditioner for you home. Hoffmann Brothers has been in the St Louis and Metro East area for over 40 years. We have installed so many different types of AC units in many St Louis area homes. You can depend on Hoffmann Brothers to not only perform quality work but to provide warranties and guarantees on every installation we do! Request a bid from one of our air conditioning installation Projects Managers through our request a bid form below or call us at 314-664-3011.